On-premise laundry operations need to be designed with enough space for workers to maneuver. NATIONAL REPORT—Hotel laundry systems—from rooms to equipment to labor—can be an often-overlooked aspect of hotel operations, especially when it comes to cost savings. Creating a well-maintained laundry room can present some challenges, especially for hotel developers who aren’t also operating the property. However, designing laundry space doesn’t need to be an area of neglect or confusion. Blair D. Hildahl, principal of Base4, leads the company’s design and innovation on these types of areas, making hospitality laundry systems both accessible and efficient. 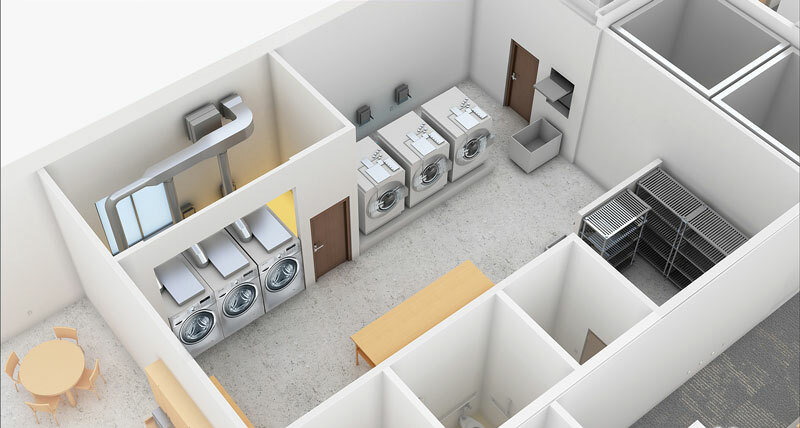 In the hospitality space, undersized laundry rooms and equipment can lead to a multitude of operational concerns, something that Hildahl is noticing. “Efficiently run laundry operations require space for housekeeping staff to work and maneuver carts. Developers who aren’t operating the hotel often mistakenly undersize these spaces to prioritize front-of-house space for guests,” Hildahl said. “Similar to undersized rooms, if developers aren’t familiar with back-of-house laundry operations, they may undersize equipment as part of a value-engineering exercise. Having equipment that cannot keep up with laundering demands leads to extended housekeeping hours,” he said. This includes ensuring there’s adequate door access to accommodate equipment delivery, which is usually handled by designers. According to Hildahl, for a typical select-service, 120-key hotel, a laundry room is approximately 500-700 sq. ft. If linens are ironed, this area should be increased by about 50%. In addition, equipment requires rear clearance for servicing, and washers need to be appropriately spaced. “During the initial conceptual space planning, you need to think through laundry travel routes from the guestrooms, meeting area and amenity spaces to the laundry room. Avoiding interaction between hotel laundry loads and guests is critical. Therefore, a rear opening elevator with direct laundry room access is an important aspect of your ground floor design considerations,” Hildahl said. Other considerations include being cautious of ground clutter and snow that can create obstructions. Hildahl recommends installing washers on the ground floor and bolted to concrete slabs to reduce vibration, along with installing dryers on an outside wall so that make-up air and venting lengths can be kept to a minimum. Knowing the adequate amount of equipment and linens is also an area to save on laundry costs. A typical 120-room property requires two to three hardmount washer extractors and two to three dryers, Hildahl said. According to Bradley Bushman, VP of technical affairs for Standard Textile, underestimating these requirements is a major industry issue. Initial equipment specifications often underestimate actual and future needs. Bushman said that hotels often operate with low linen inventory levels causing product shortages, loss of linen life, lowering of quality standards and, as a result, a decrease in guest satisfaction. 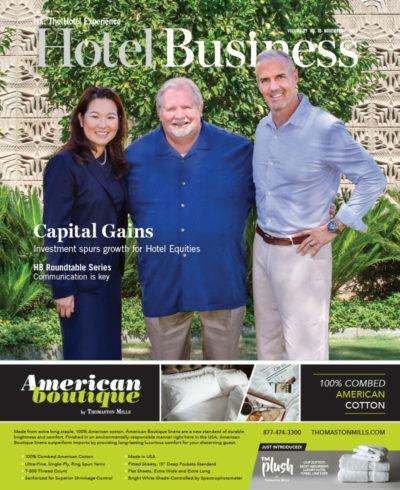 “Linen replacement costs can quickly rise when hoteliers are dealing with poor linen quality, loss, low par levels, aggressive washing formulas and staining,” Bushman said. “Effective management of linen inventories should include maintaining linen specifications, correcting par levels, monitoring and classifying reasons for rejected linen, establishing and controlling laundry formulas and scheduling routine service calls with the hotel’s chemical supplier—a service report should be required,” he said. This type of maintenance and attention comes standard with all laundry practices; however, the industry is evolving when it comes to product availability and guest expectations. Both equipment and linens usually reserved for bigger brands are now available for smaller, boutique properties, without having to sacrifice quality. Smaller hotels are using continuous batch washers for example, which can reduce operational costs, Bushman said. “A broad range of styles and qualities of hospitality linen is available. Depending on the type of facility, guests will have different expectations, especially as it relates to the quality of the linen used and budget versus boutique,” Bushman said. “Differences in linen quality can have a big impact on the laundering process used and results expected. Thicker or heavier terry can decrease productivity, and those with color dyes, prints or embroidery must be washed in a color safe manner. The one universal expectation is for linen to be clean and hygienic. For this reason, white linen will continue to be preferred by most guests,” he said. Hotel operators also have some expectations of their own, especially when it comes to operating efficiency. Hildahl said that hoteliers prefer large-capacity tumble dryers with auto-dry, anti-wrinkle functioning, self-cleaning lint filters, along with safety features like a high-temperature auto response system, which automatically sprays water on the linens in the unit when detecting a laundry fire. He also said that hoteliers often opt for natural gas over electric as a more efficient heating source. It ultimately all comes down to people, and investing in them—not only equipment—can sometimes make all of the difference for a hotel in both saving on laundry costs—labor makes up about 45-55% of hotel laundry expenses—and in fostering a positive guest experience. According to Bushman, the demand for technical positions and skills related to equipment installation, maintenance, programming and repair is on the rise. However, labor gets costly when equipment gets older, volume outgrows capacity and when workflow is inefficient.